Earthâ€™s First Civilization: Antarctica, 55 Million B.C. 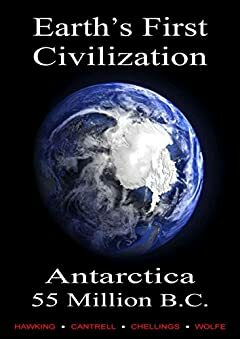 New Release: Explore Evidence of an Advanced Civilization on the Antarctic Continent in the Paleocene Epoch, and other Mysterious Cultures of Prehistory. For decades the archaeological community labored under the theory that human civilization began after the last Ice Age. The theory conjectured that, prior to that time, humans were no more than primitive hunter-gatherers incapable of communal organization or sophisticated abilities, and it was only after the last glacial periodâ€”following the melting of the 10,000 foot thick ice sheets that covered much of the northern portion of the worldâ€™s continentsâ€”that our human ancestors began to develop agriculture and complex economic and social structures, sometime around 4000 B.C. Contemporary discoveries have dramatically undermined those theories. Modern research has unearthed buried civilizations and discovered hidden cities one after anotherâ€”archaeology now reconstructs an unsuspected antiquity of man and paints a canvas of stunningly mysterious dimensions. Previous academic accounts of the origins of civilization have fallen forfeit to evidence from archaeological sites worldwide, including Thebes (c. 37,900 BC), Edfu (c. 18,000 BC), Turkey (c. 12,000 BC), Bolivia (c. 15,000 BC), Indonesia (c. 22,000 BC), and, most intriguingly, in Antarctica. To explore these remarkable finds, this book has four primary purposes: 1) to present archaeological and other competent evidence demonstrating that civilizations of tremendous antiquity once existed on our planetâ€”evidence either known, inexactly known, or currently tentative; 2) to examine evidence regarding the true age of those civilizations; 3) to explore the possible origins of those civilizations; and 4) to reveal the profound esoteric knowledge and technical abilities possessed by the cultures of those civilizations. Doubtless many of the very earliest chapters of our planetâ€™s history will lie forever silent under her most desolate soil and deepest waters, yet extant legends and traditions have been too readily set asideâ€”academic pedants love to brand as mythical the accounts which have endured the millennia, and which mischievously persist. New Release, Kindle e-reader page count 296 (estimated, actual count varies with the reading device used). For more information, please see the â€˜Look Insideâ€™ feature on this page. Thank you.